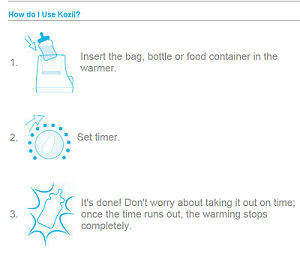 You will be very interested in the Kiinde Kozii Baby Bottle Warmer Review and Giveaway if you believed that the convenience of safely warming a bottle had skipped town when we were told microwaving the baby’s bottle was a NO NO! I don’t know about you but I find bouncing a crying baby on my hip at 2am while The waiting on a bowl of warm tap water (which is painfully slow and often very inaccurate) to warm things up to be rather stressful. And thankfully, now it’s unnecessary. The Kiinde Kozii is a breastmilk and bottle warmer that safely and quickly warms baby‘s bottle without having to sacrifice safety with the use of SAFEHeat. WHAT IS WRONG WITH STEAM WARMERS? Steam bottle warmers are fast but they expose the milk to temperatures that are so hot (far above 50C) that the proteins in breast milk start to break down (denature). WHY IS THE KIINDE KOZII BETTER? I learned in doing my research for the Kiinde Kozii Baby Bottle Warmer Review and Giveaway that this system is better because the SAFEHeat flowing water bath promotes heat transfer yet the water in the bath is no hotter than warmed water from the tap yet it warms the bottle as quickly as the steam warmer without the danger of overheating the milk and destroying nutrients. PLUS, the water drains so there never a risk of overheating. The Kindii Kozii is safe and convenient and the SAFEHeat technology prevents hot spots, nutritional damage not to mention the release of dangerous chemicals that may be released into the milk from plastic bottles exposed to high temperatures AND the Kiindi Kozii uses CDC and USDA guidelines to safely and easily thaw and warm breastmilk! It is easy to use! Using this device is just as easy as the microwave without the safety issues. Just set the timer and VOILA! It shuts off automatically so no worries that the milk will be too hot if you happen to fall asleep or answer the phone or what have you. The water in the reservoir lasts awhile so there is no need to refill it each time you use it. You can heat any kind of bottle or storage bag as well as jars of baby food! I believe that any mom who has bottles and baby food to warm will be shouting their love for the Kiinde Kozii from the rooftops! And here’s another little tidbit you will be shouting about; you can enter to win your own warmer in the Kiinde Kozii Baby Bottle Warmer Review and Giveaway! To enter this giveaway, just visit the official Kiinde website and return to leave a comment indicating which of the features of this bottle warmer you like the best AND LIKE Unique Baby Nursery Decorating Ideas on Facebook and leave a post on my wall with your username in your comment. You MUST complete the mandatory actions for your entries to count in the contest. Here are a few easy ways that you can get bonus entries. 2. Follow msbaby on Twitter and tweet: Check out the Kiinde Baby Bottle Warmer Giveaway contest hosted by @msbaby – Enter to win here: https://www.unique-baby-gear-ideas.com/free-baby-stuff.html shorten url and leave a comment. You can tweet the Kiinde Kozii Giveaway DAILY and leave a comment each time. Enjoy a tour of our picture gallery that features photos filled with nursery ideas that have been entered in our BABY NURSERY PICTURES CONTEST and vote for your favorite in the comments section then tell me where I can find your vote for 10 entries and be sure to tell the moms which of their baby nursery themes and ideas are your favorites. 7. Post a link to my baby blog (using my URL), with a link back to pick up (10 bonus entries) and keep up with our latest sweepstakes and contests. 9. Be a GFC follower of Baby Shower Cake Ideas and please post your user name for verification purposes for 5 bonus entries. The Kiinde Giveaway contest will end on Wednesday October 19, 2011 and is open to residents of the United States only (void where prohibited by law). The winner of the Kiinde Kozii Giveaway contest will be contacted via email and will have 48 hours to confirm before a new winner is chosen. Thanks to Kiinde for sponsoring Kiinde Kozii Baby Bottle Warmer Review and Giveaway for their sponsorship and for the Giraffe Blanket Pet that they sent me to review! There is No Purchase Necessary to enter the Kiinde Kozii Baby Bottle Warmer Review and Giveaway contest or any of the other freebies I have posted and I received no compensation for my review or opinions. 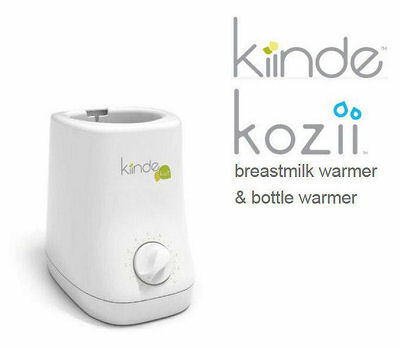 Thank you for posting the review of Kiinde Kozii Baby bottle warmer. I found one secondhand for a great price but was reluctant to buy it until I saw your comments. I lve that it does not damage the nutrients in the breastmilk and that no harmful chemicals are leeched into the milk from your bag or bottle. I love the fact that is stops heating completely once the time is shut off. Great safety feature! I like that it uses SAFEHEAT & also no Chemicals to worry about. I like that the Kiinde has a reservoir that you don't have fill every time you use it! Who wants to remember to do that in the middle of the night? Great feature! After seeing the 1,2,3 steps with pictures I am convinced that it is easy enough for even my husband to use it! I like that it has automatic shut off. Viewed and commented on your youtube video on the mureal (as liliumcavaliers). I viewed and commented on your youtube video about wall murals. I love that it shuts off automatically! I love that the SAFEHeat™ ensures that the contents of the warmer are brought to the same temperature every time as easily as possible. I also like unique baby nurseries on facebook my username is Stephanie Landeros!